این مقاله به منظور بررسی تأثیرات رسانه بر فرهنگ‌سازی، ابتدا به تبیین لایه‌های شش‌گانه فرهنگ شامل: باورها، ارزش‌ها و هنجارها (به عنوان هسته فرهنگ) و نماد‌ها و اسطوره‌ها، آیین‌ها و آداب و رسوم، و فناوری‌ها، مهارت‌ها و نوآوری‌ها (به عنوان پوسته فرهنگ) می‌پردازد. سپس با واکاویِ مفهومی فرهنگ‌سازی مشتمل بر فرهنگ‌پذیری (به معنای تأثیرگذاری بر هسته و پوسته فرهنگ) و فرهنگ‌گرایی (به معنای تأثیرگذاری بر پوسته فرهنگ) و با بهره‌گیری از نظریه‌های ارتباطی، به تجزیه و تحلیل تأثیرات فرهنگیِ رسانه‌ها در عرصه‌های اندیشه‌پردازی، ارزش‌گذاری، هنجار‌سازی، نماد‌سازی، جامعه‌پذیری، الگوسازی و نوآوری رفتاری مبادرت می‌ورزد و این فرضیه را مورد آزمون قرار می‌دهد که رسانه‌ها در عرصه هسته فرهنگ از توان تعلیمی و تثبیتی در زمینه فرهنگ‌پذیری برخوردارند و در مورد پوسته فرهنگ دارای توان تغییر رفتارها و الگوهای اجتماعی در جهت فرهنگ‌گرایی هستند. نگارنده در پایان، استلزامات چشم‌انداز مثبت فعالیت‌های رسانه‌ای در عرصه فرهنگ‌سازی را خاطرنشان می‌سازد. Adorno, T. W. (1993) “Theory of Pseudo-Culture”, Telos, Vol. (95): 158-177. Bastide, D. (1987) Religious Education, Lewes: Falmer press. Bastide, R. (1960) “Problèmes de l’entrecroisement des civilisations et de leurs oeuvres” in George Gurvitch (dir), Traité de sociologie, Paris: PUF. 4 Bednarts, D. (1384 [2005 A.D]) “Nahve-h Kâr-e Majale-h Beynolmelali-ye Spiegel: Qodrat va Naqŝ-e Rasâne-h-hâ dar Kâheŝ-e Tahdidhâ-ye Jahani” (Persian Translation of The Function of International Journal of Spiegel; Power and Role of Media in Reducing the Global Threats), Majmoe-h Soxanrâni-hâ va Maqâlât-e Erâe-h Ŝode-h dar Panjomion Seminâr-e Rasâne-h-iye Iran va Almân, Tehran: Markaz-e Câp va Enteŝârât-e Vezârat-e Omour-e Xâreje-h.
Bennet, J. (1973) “Culture”, in Encyclopedia Americana, USA, Chicago Publisher, pp. 313-316. Boeren, A. (1379 [2000A.D]) Bod-e Farhangi-ye Ertebâtât Barâ-ye Tose-h (Persian Translation of The Cultural Dimension of Communication for Development), Translated by Mehrsimâ Falsafi, Enteŝârât-e Markaz-e Tahqiqât, Motâleât va Sanjeŝ-e Barnâme-h-iye Sedâ va Simâ. Bonté, P. & Izard, M. (1991) Dictionnaire de l’ethnologie et de l’anthropologie, Paris: PUF. Bourdieu, P. (1990) In other Words: Essays toward a Reflexive Sociology, Cambridge: UK: Polity Press. Carlsson, U.; Tayie, Samy; Jacquinot-Delaunay, Genevieve & Tornero, José Mannuel Pérez (Eds.) (2008) Empowerment through Education: An Intercultural Dialogue, Sweden: Goteborg University. Casino, J. 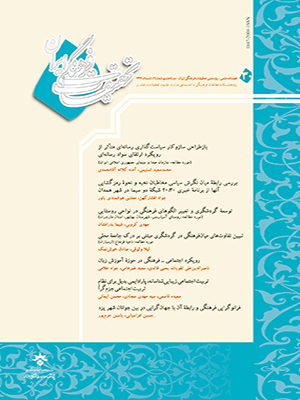 (1364 [1985 A.D]) Qodrat-e Television (Persian Translation of Television Power), Translated by Ali Asadi, Tehran: Enteŝârât-e Amir Kabir. Collett, P. (1977) “The Rules of Conduct”, P. Collett (Ed.) Social Rules and Social Behavior, Totowa, NJ: Rowman and Littlefield. Copley, T. (1994) Religious Education: Developing Primary Teaching Skills, London: Routledge. Cuche, D. (2004) La notion de culture dans les sciences sociales, Troisième Edition, Paris: La Découverte. Dalfen, Charles M. (1979) “Cultural Values and Communication”, Series: Cultures, VI, 1, Paris: Unesco Publications. Debray, R. (1997) Transmettre, Paris: Odile Jcob. Media Cooperation: Qodrat va Naqŝ-e Rasâne-h-hâ dar Kâheŝ-e Tahdidhâ-ye Jahâni (The Function of International Journal of Spiegel; Power and Role of Media in Reducing the Global Threats), Majmoe-h Soxanrâni-hâ va Maqâlât-e Erâe-h Ŝode-h dar Panjomion Seminâr-e Rasâneh-iye Iran va Germany, Tehran: Markaz-e Câp va Enteŝârât-e Vezârat-e Omour-e Xârejeh. Dehŝiri, M. (1381 [2002 A.D]) Naqŝ-e Rasâne-h-hâ dar Arse-h Siyâsat-e Xâreji dar Asr-e Jahâni Ŝodan (Persian Translation of Media Role in Foreign Policy; Age of Globalization), Majmoe-h Soxanrâni-hâ va Maqâlât-e Erâe-h Ŝode-h dar Panjomion Seminâr-e Rasâne-h-iye Iran va Germany, Tehran: Markaz-e Câp va Enteŝârât-e Vezârat-e Omour-e Xâreje-h.
Dehŝiri, M. (1384 [2005 A.D]) Osol-e Xabar Resâni va Barnâme-h Sâzi dar Rasâne-h Meli (Persian Translation of Principles of Programming in National Media), Tehran:Enteŝârât-e Sorouŝ. Dressler, W. (2002) A Working Definition of Culture, Department of Anthropology and School of Social Work, University of Alabama. Durkheim, E. (1965) The Elementary Forms of the Religious Life, New York: Free Press. _____ (1978) De la division du travail social, 10e Edition, Paris: PUF. Gerbner, G. (1985) “Field Definitions: Communication Theory”, U. S. Directory of Graduate Programs (1984 1985) 9th Edition, USA. Grossberg, L. Nelson, C. & Treichler, P. (Eds), (1992) Cultural Studies, London: Routledge & kegan Paul. Haj Seyyed Javâdi, A. (1357[1978 A.D]) Mabâni-ye Farhang dar Jahân-e Sevom (Persian Translation of The Basic of Culture in Third World), Tehran: Enteŝârât-e Ravâq. Haralomobos & Holburn, (2000) Sociology Themes and Perspectives, 6th edition, London: Harper Collins. Herskovits, M.; Linton, Ralph, Redfield, Robert, (1936) “Memorandum on the Study of Acculturation”, American Anthropologist, Vol. 38 (1): 149-152. Hoovert, S. (1382 [2003 A.D]) Bâzandiši Darbâreh-ye Rasâne-h, Din va Farhang (Persian Translation of Rethinking Media, Religion and Culture), Translated by Masood Ariâi Niâ, Tehran: Enteŝârât-e Sorouŝ va Markaz-e Tahqiqât, Motâleât va Sanjeŝ-e Barnâmeh-iye Sedâ va Simâ. Inglis, F. (1377 [1998 A.D]) Nazariye-h Rasâne-h-hâ (Persian Translation of Media Theory), Translated by Mahmood Haqiqat Kâŝâni, Tehran: Enteŝâarât-e Markaz-e Tahqiqât, Motâleât va Sanjeŝ-e Barnâme-h-iye Sedâ va Simâ. Jensen, K. B. (1995) The Social Semiotics of Mass Communication, London: Sage. Kelly, J. (1983) Leisure Identities and Interaction, London: Allen and Unwin. Kress, G. (ed. ), (1988) Communication and Culture, Kensington: University of New South Wales Press. Laul, J. (1379 [2000 A.D]) Rasâne-h-hâ , Ertebâtât, Farhang: Rahyâfti Jahâni (Persian Translation of Media, Communication, Culture: the Global Approach), Translated by Majid Nekoodost, Tehran: Moasese-h Enteŝârât-e Roznâme-h Iran. Lull, J. (2000) Media, Communication, Culture: A Global Approach, Second Edition, Cambridge, UK: Polity Press. Lull, J. (ed. ), (1988) World Families Watch Television, Newbury Park, CA: Sage. Mâleki, M. (1383 [2004 A.D]) Bâyeste-h-hâ-ye Xabar (Persian Translation of News Essentials), Tehran: Enteŝârât-e Sorous. O’Brien, R. (1984) “Mass Media, éducation et transmission des valeurs”, in: Series: Media Education, Paris: Unesco Publications. Owhadi, M. (1376 [1997 A.D]) “Rasâne-h-hâ va Jahâni Ŝodan-e Frahang” (Persian Translation of Media and Globalization of Culture), Ketâb-e Sorouŝ, Majmoe-h Maqâlât-e 2: Rasâne-h-hâ va Frahang, Tehran: Enteŝârât-e Sorouŝ. Poirrier, P. (Université de Bourgogne) (Janvier-Juin 2007), Politique culturelle et patrimoines, Vieille Europe et Nouveaux mondes, Dans : Culture & Muse`es, Revue. Qâemmaqâmi, F. (1356 [1977 A.D] Amozeŝ yâ Estemâr-e Farhangi (Persian Translation of Education or Cultural Imperialism), Tehran: Enteŝârât-e Jâvidân. Servent, P. (1387[2008 A.D]) Xiyânat-e Rsâne-h-hâ (Persian Translation of La Trahision, des Medias), Translated by Mohammad Reza Dehsiri, Tehran: Pažoheŝkade-h Motâleât-e Farhangi va Ejtemâi. Smith, Anthony D. (1991) National Identity, London: Penguin Books. Tehrâniân, M. (1373 [1994 A.D]) “Enqelâb-e Bozorg va Rasâne-h-ha-ye Kocak” (Persian Translation of Big Revolution and Small Media), Mahnâme-h Farhangi va Honari-ye Kelk, Vol. - (60) 31-319. Thompson, J. B. (1990) Ideology and Modern Culture: Critical Social Theory in the Era of Mass Communication, Stanford CA: Stanford University Press. Thompson, J. B. (1995) The Media and Modernity: A Social Theory of the Media, Cambridge: Polity Press. Tomlinson, J. (1999) Globalization and Culture, Cambridge: Polity Press. Tylor, E. (1871) Primitive Culture: Researches into the Development of Mythology, Philosophy, Religion, Art, and Custom. New York: Gordon Press. UNESCO, (2003) “Convention of Intangible Cultural Heritage”, www.unesco.org. Williams, R. (1958) Culture and Society: 1780-1950, New York: Columbia University Press. Xâniki, H. (1376 [1997 A.D]) “Farhang-e Jamii va Rasâne-h-hâ-ye No” (Persian Translation of Mass Culture and New Media), Ketâb-e Sorouŝ, Majmoe-h Maqâlât-e 2: Rasâne-h-hâ va Frahang, Tehran: Enteŝârât-e Sorouŝ.